A student from Staffordshire is locked in a battle to be reunited with his Brazilian bride who has been refused a visa to live in the UK. 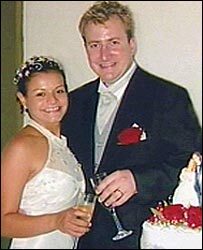 Chris Gibbs, from Stoke-on-Trent, married his wife Angelica in Brazil last September. But the Brazilian authorities decided it was a marriage of convenience and she has been refused a visa. She has been forced to remain in Brazil. The couple hope an appeal against the decision next week will reunite them. Mr Gibbs married his wife in her home city of Fortaleza, 15 months after they first met as students in England. But when his new bride tried to rejoin her husband three months after the ceremony she was refused a visa. Since then Mr Gibbs has had to keep in touch with his wife via e-mail. "It's absolutely not a marriage of convenience, I love Angelica very dearly," he said. "When we're away from each other it's very hard for me." He hopes an immigration tribunal next week will allow his wife to stay in the UK so the couple can start their married life together. "If we get a visa after this tribunal it will be a year of marriage which no-one's ever going to give back to me," he said.